I went to see a bunch of short animation films at the Animatricks movie festival. Some were good, some were tiresome, some were okay. In general, it felt a bit like watching the same kind of material I can watch on Vimeo and sure enough when I checked for more information online, some of them were uploaded there. Apparently the available selection for an annual festival dedicated to animation is quite slim, which is a pity really. Well, it is nice to see them on the big screen. 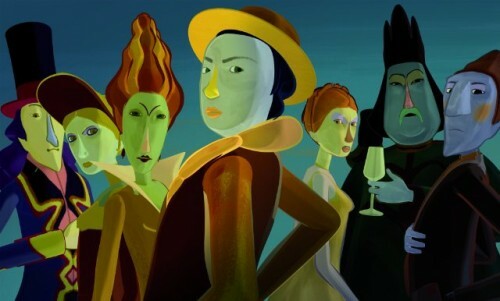 “The Painting” takes place inside a unfinished painting where finished figures look down towards imperfect ones (image copyright Blue Spirit Animation). There were also two full feature films available too, of which I went to see The Painting from France. The animation quality was top notch and the story itself was a playful fantasy of paintings having a life of their own. It was a refreshing change to see something like this. Of the short films, maybe the one that I enjoyed most was “Breakfast on the grass” from Estonia. It was a reference of a painting of the same name which I’m not familiar with, but for me I couldn’t help but wonder did the creator get his inspiration from drunken Finns visiting Tallinn. It all looked so familiar. Yes, it is simple by concept, but very well executed.